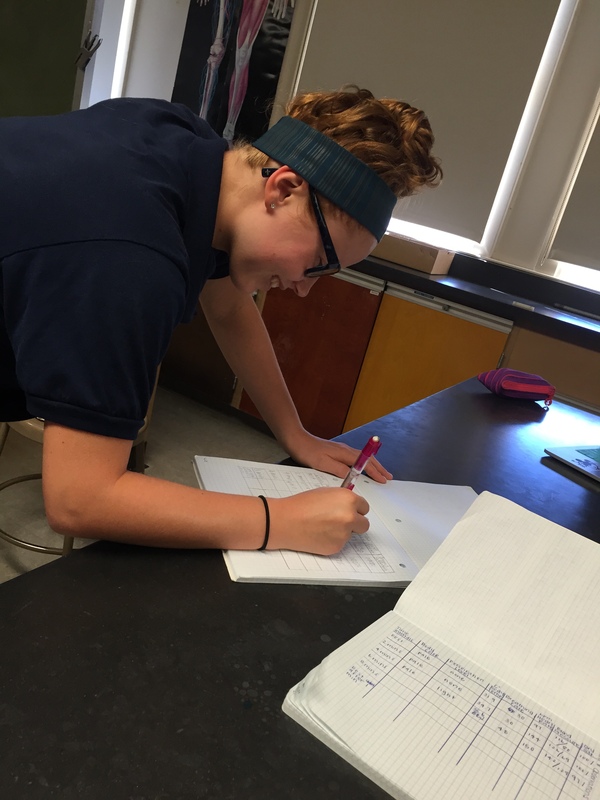 The purpose of the homeostasis lab was to identify the conditions that need to be constant in order to keep the body stable and in equilibrium, as well as observe and analyze how humans maintain stable internal conditions, while external conditions are changing and conflicting them. Homeostasis is a system that helps maintain stability and equilibrium in the internal conditions of the body, while external conditions, such as exercise, are conflicting them. Exercise causes many factors of homeostasis to work in order to maintain stability and equilibrium in the body. Some of these factors can be determined by measuring, observing, and analyzing certain conditions of the body. Some of these conditions are: change in skin color on arms and face, perspiration level, external body temperature, breathing rate, heart rate, blood pressure, and oxygen saturation. The conclusion I came to was that the body changes the conditions in order to keep itself stable and in equilibrium. These changes help the body to release heat (sweat) and to increase the amount of oxygen and blood flow throughout the body in order to maintain the physical activity. 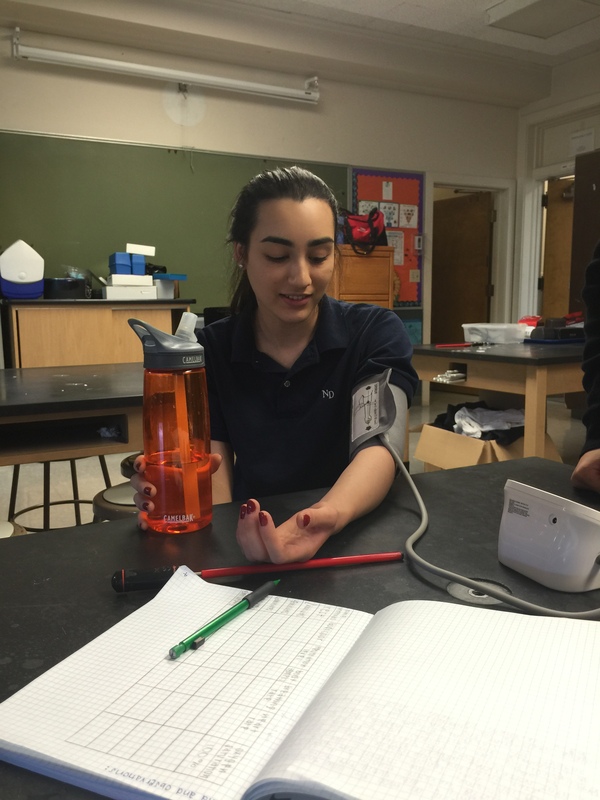 The data that my group and I gathered shows that perspiration level, body temperature, heart rate, and blood pressure increased from at rest, which was before the lab started, to exercising for 6 minutes. This means that the body was working hard to release heat and to allow the lungs and the heart provide energy, oxygen flow, and blood flow in order to maintain the physical activity. The skin color and breathing rate remained relatively the same throughout this activity because the skin color depends on the person’s body and this could be because the exercise was not as difficult for the person to perform to see a change in the skin color, and the person did recover quickly at each 2-minute intervals, therefore her breathing rate remained the same. Lastly, oxygen saturation remained relatively the same as well. 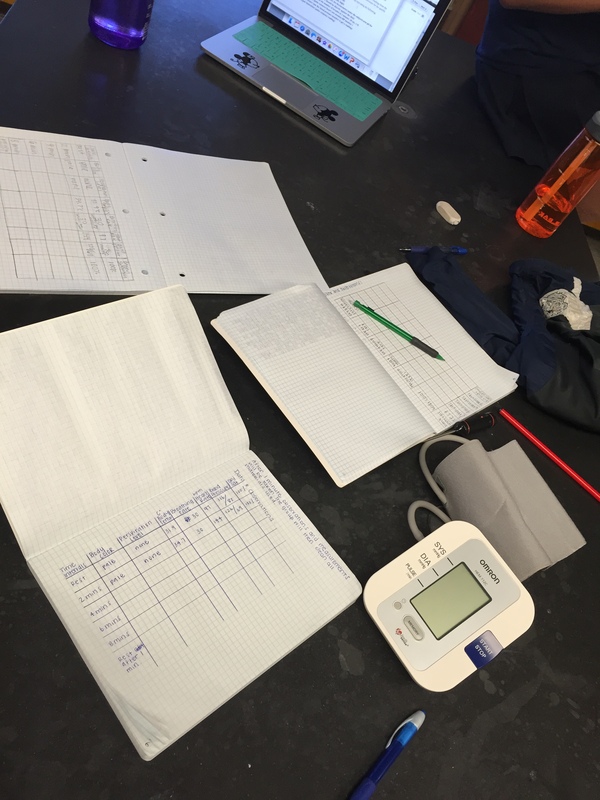 The ideal percentage for oxygen saturation is 100% and the student did maintain constant oxygen saturation.